C&IS hosted its biennial Hall of Fame dinner on Thursday, Oct. 4, in the North Zone at Bryant-Denny Stadium. This year, C&IS honored four inductees: Jennings F. Bryant Jr., Rece Davis, Fred D. Gray and Houston and Voncile Pearce. As this year’s emcee, the College welcomed home Edelman Senior Vice President, Lindsay Garrison. The photo album from this year’s ceremony can be viewed here. 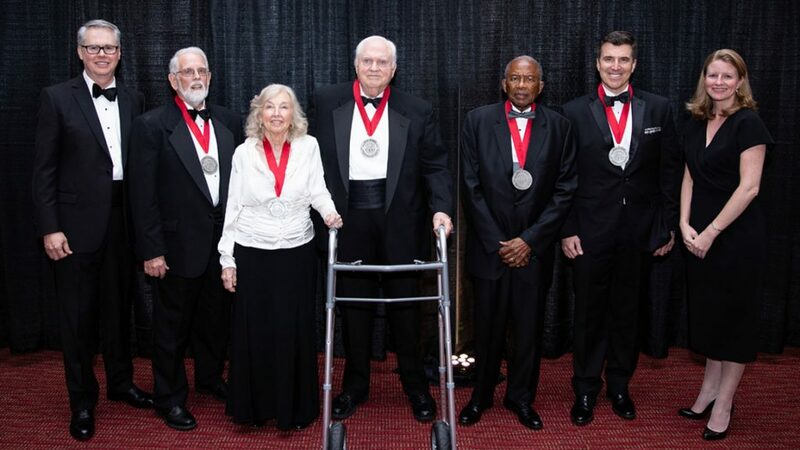 Additionally, the video produced by the Center for Public Television to honor each of our inductees can be viewed here. More information about each of the Hall of Fame inductees is available below. Rece Davis is best known as the host of ESPN College GameDay, the longest-running and most-celebrated college football pregame show on television. In his time at ESPN, Davis has hosted and contributed to programming ranging from NBA highlights to ABC’s Triple Crown horse racing. Davis graduated from UA with a bachelor’s degree in broadcast film communication in 1988. Fred D. Gray is a civil rights attorney whose career includes representation of both Rosa Parks and Dr. Martin Luther King Jr. at a pivotal time in the civil rights movement. As a stalwart advocate for the rights of others, his impact travels far beyond his home state of Alabama. Houston and Voncile Pearce spent much of their lives together establishing, owning and operating radio stations across the Southeast. Beyond their legacy as broadcasters, the Pearceshave served on various boards and actively supported local charities and organizations through the reach of their radio stations. Houston graduated from UA with a bachelor’s degree in commerce and business in 1955, and Voncile graduated with a bachelor’s degree in mathematics in 1967 and a master’s degree in mathematics in 1969. Established by the College’s Board of Visitors in 1998, the Communication and Information Sciences Hall of Fame was created to honor, preserve and perpetuate the names and accomplishments of individuals who have brought lasting fame to the state of Alabama through the application of disciplines taught, researched and practiced in the College.